From Lady Gaga and Bradley Cooper's heart-stopping rendition of "Shallow" to Spike Lee's huge win, the 2019 Academy Awards were full of big moments. 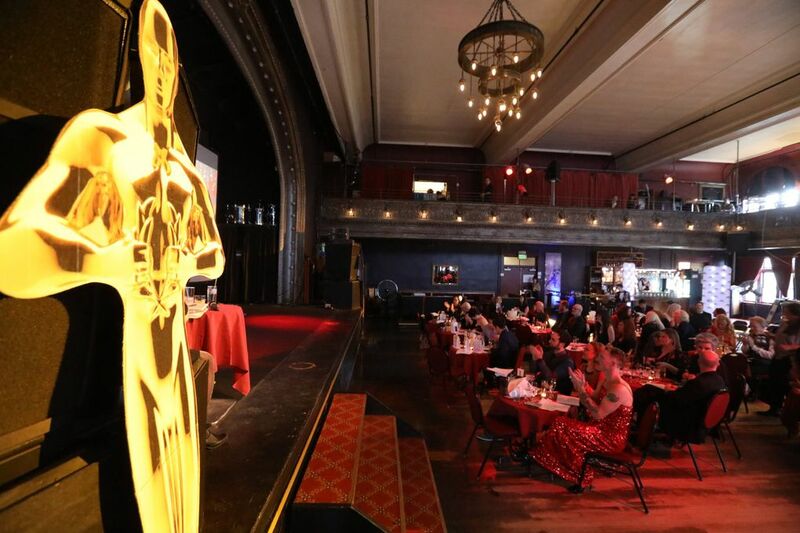 The Seattle Times features staff watched the show from six Oscars parties and handed out awards of our own. The 2019 Academy Awards brought many questions: Will “Roma” win both Best Picture and Best Foreign Language Film? (No, “Green Book” claimed the former.) Will Glenn Close finally win an Oscar? (No — Best Actress went to Olivia Colman.) Will Lady Gaga wear something insanely over-the-top? (No, she went for a classic look, really.) But it also brought an unmistakable truth: It’s a very good excuse for a party. The gorgeous Century Ballroom was decked out with giant cardboard Oscars and red-clothed tables, and Bethany Jean Clement and I dressed up in our best black formalwear and joined the crowd. Hosts Waxie Moon and Rebecca Mmm Davis sat at a table onstage, adding commentary during the commercial breaks (they disagreed on Jennifer Hudson’s outfit), but during the awards everyone watched more or less rapt. 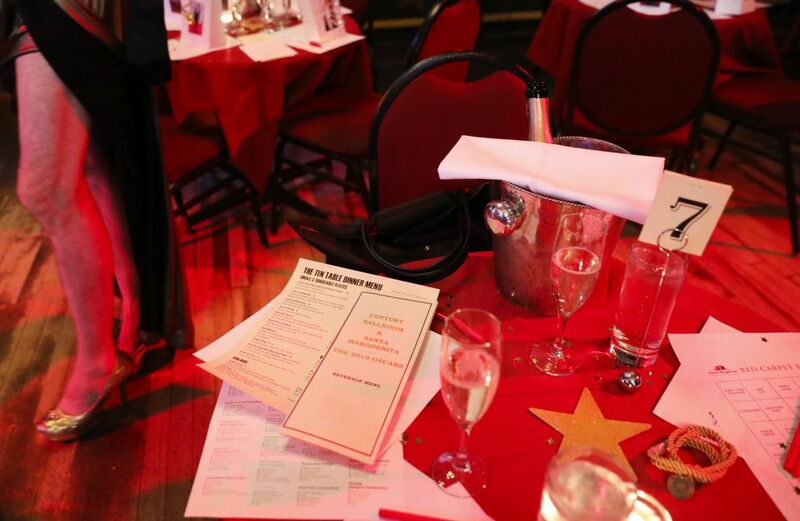 We treated ourselves to a VIP table that came with a bottle of bubbles, and we’re pretty sure that even without that, we’d nominate the Century Ballroom for the Best Place Ever to Watch the Oscars. 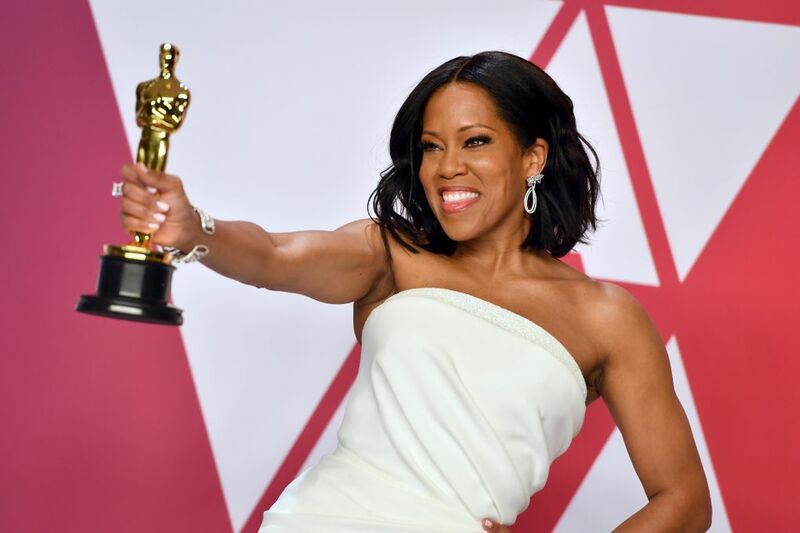 Moment that made the three hours worth it: Seeing so many women and people of color winning awards, and on the red carpet seeing women in suits and men in skirts — in general, an Oscars that seemed tremendously more welcoming and inclusive. Best performance by a snack: The crab and artichoke dip, because the pita achieved an Oscar-worthy goldness without being dry. Best performance by a garnish: The adorable lemon-peel star on the rim of the Award of Merit, a delicious cocktail involving vodka, grapefruit and bubbly. Best outfit on a party guest: A gentleman wearing an elegantly red-sequined, spaghetti-strapped gown (we think he won the costume contest, but it was a little chaotic). Best performance by someone’s hair: The very nicely curled conductor who led the symphonic performance behind the “In Memoriam” sequence. 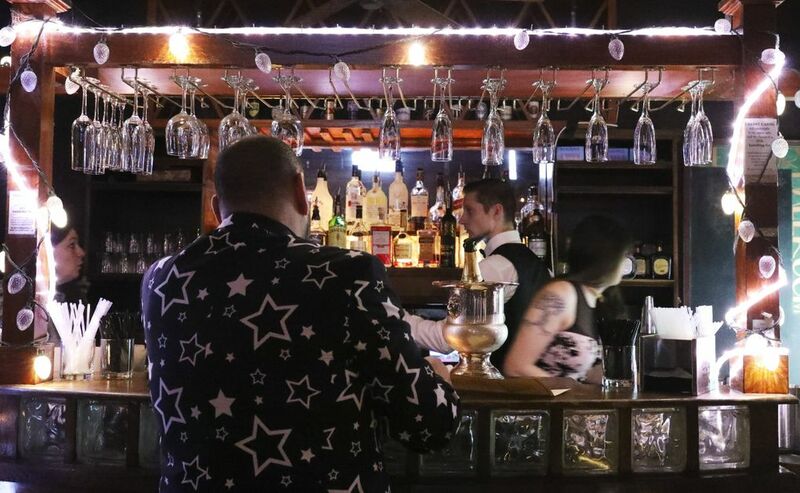 At the Gay City offices, bookshelves stuffed with LGBTQ+ books — they say it’s the largest LGBT library in the Pacific Northwest — were converted into bar tables. 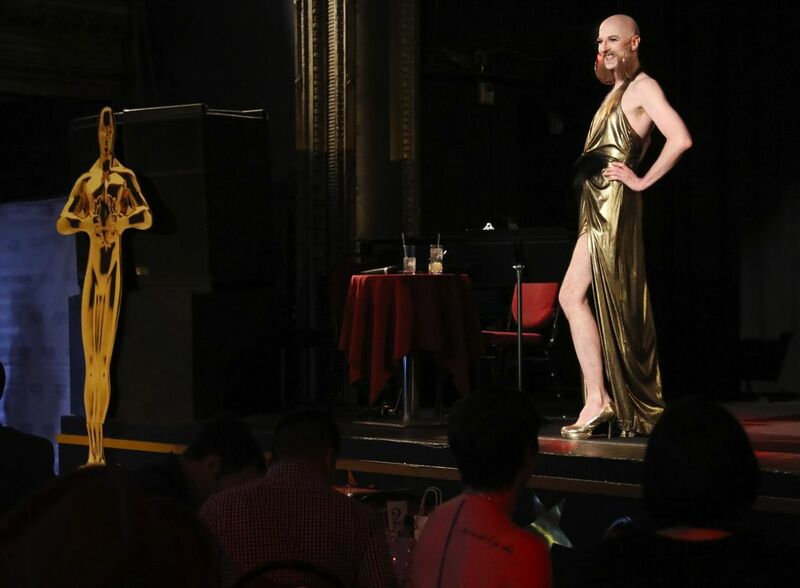 An office became a small banquet hall, and a little rectangle of carpet and a gold backdrop became “The Pink Carpet” where attendees strutted and showed off their Oscars-party style … And there was an amazing amount of style at Gay City’s annual Academy Awards party. Wandering the room carrying trays of multicolored Jell-O shots and wearing green jerseys were members of Seattle’s gay rugby team. 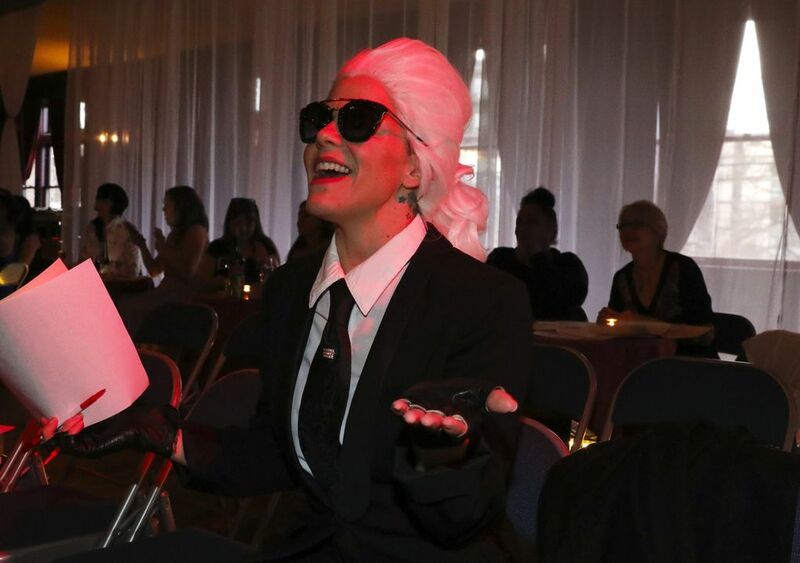 Host and local drag entertainer and activist Gaysha Starr kicked off the night in a sleek black pantsuit offset by a large green bow that they said was inspired by Awkwafina’s chic Oscars outfit. But once the show started, Starr busted out the sparkles in a long sparkling gown. Usually the Gay City party is held at the Egyptian or Cinerama. This year marked its first time at the Gay City offices. 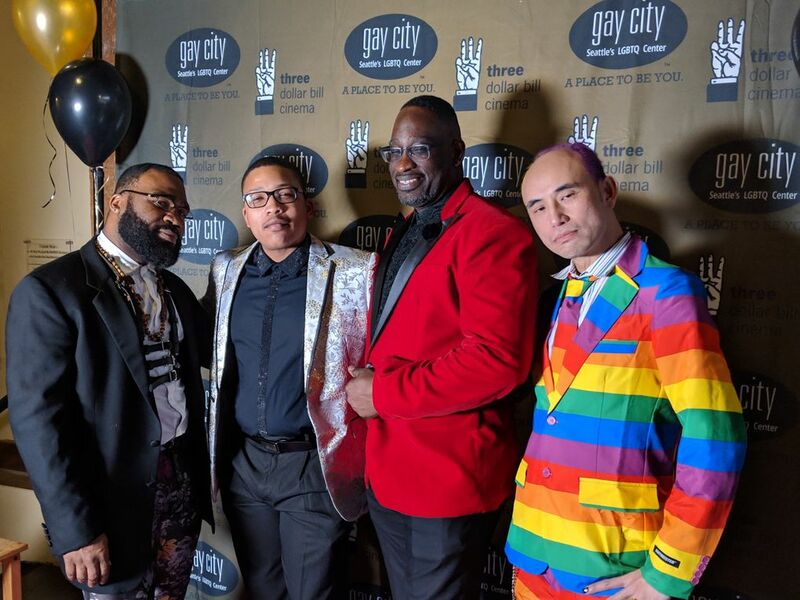 “I think it’s great that it’s here (at Gay City’s offices) … because it’s a community resource and people often just walk by without realizing they can come in,” Starr said. Best Oscar presenter: When Bryan Tyree Henry came out to present best costume design, the whole room let out a sweet “awww,” immediately followed by a mix of laughter and cheers for Melissa McCarthy’s over-the-top outfit. Moment that made these three hours worth it: Watching everyone go completely, I mean completely quiet when Lady Gaga and Bradley Cooper took the stage. And then the total opposite — loud screams and “Oh my gods!” — when Lady Gaga took the stage for her best original song award. Runner-up: Everyone freaking out almost as hard as Samuel L. Jackson when Spike Lee finally won his Oscar! When we temporarily lost audio during his acceptance there was a collective “Nooooooooo! !” before we got it back. 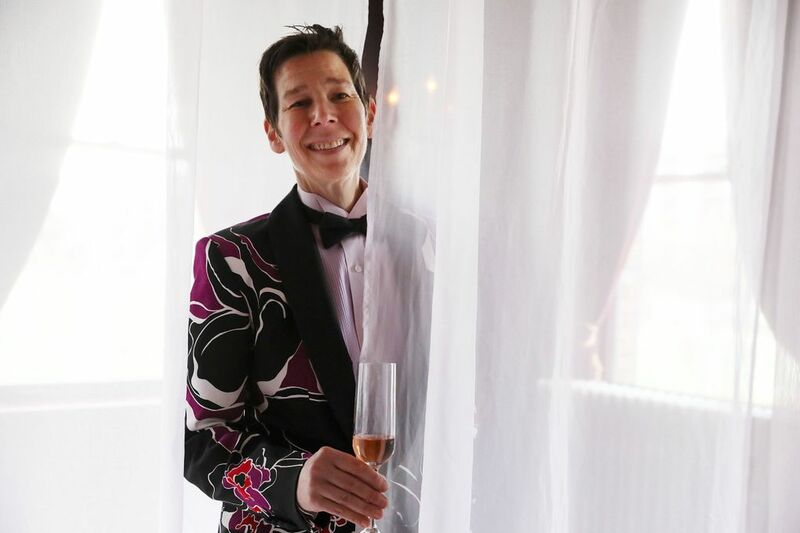 Biggest snub: When Olivia Colman won for Best Actress, the room erupted half into cheers and half into mutters and mildly suppressed protestations, but everyone fell in love with her during her quirky acceptance speech, eliciting the most laughter of the evening. And of course she completely won the crowd over when she shouted out Lady Gaga at the end! Best performance by a snack: Do Jell-O shots count as a snack? No? Then, definitely the rainbow rose sheet cake. 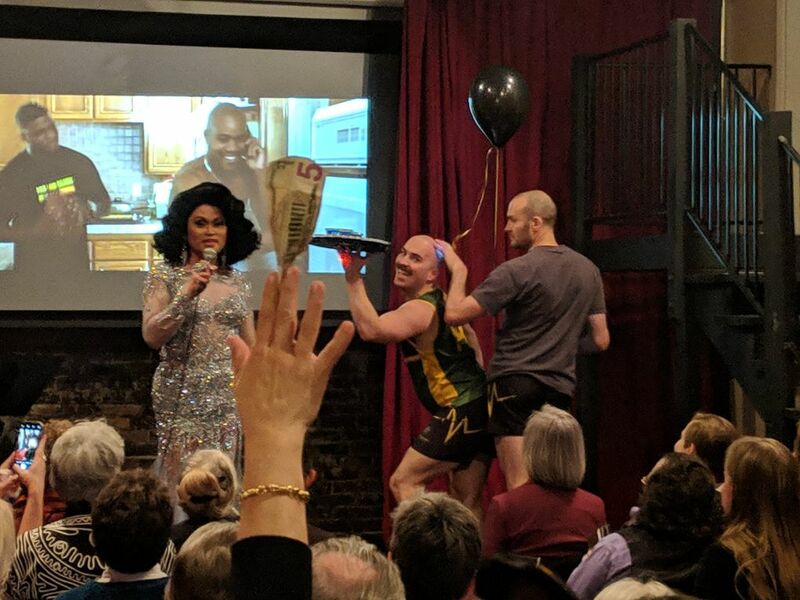 Best quote: “I know way too much about shapewear right now” — Host Gaysha Starr as they gestured to their midsection in their sparkling gown. Best supporting beverage: Jell-O shots delivered with a flourish by members of the uniform-clad members of Quake, Seattle’s gay rugby team. Plus, they were going for 2 for $5 or 5 for $10. A steal! Best dressed: The gowns always get all of the attention at the Oscars, but these four stylish folk defied the notion that suits have to be black, white and boring. 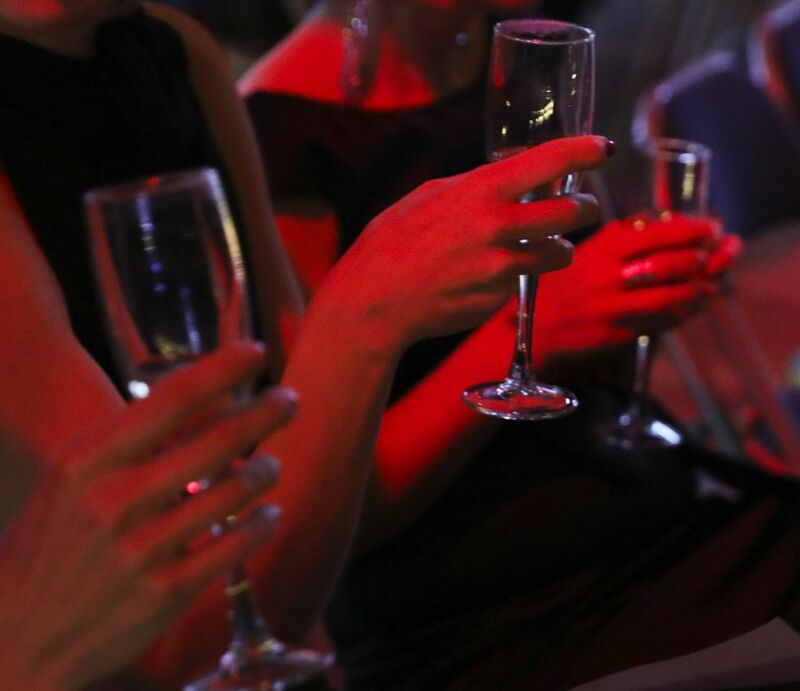 This Oscars party provided guests with true star treatment. 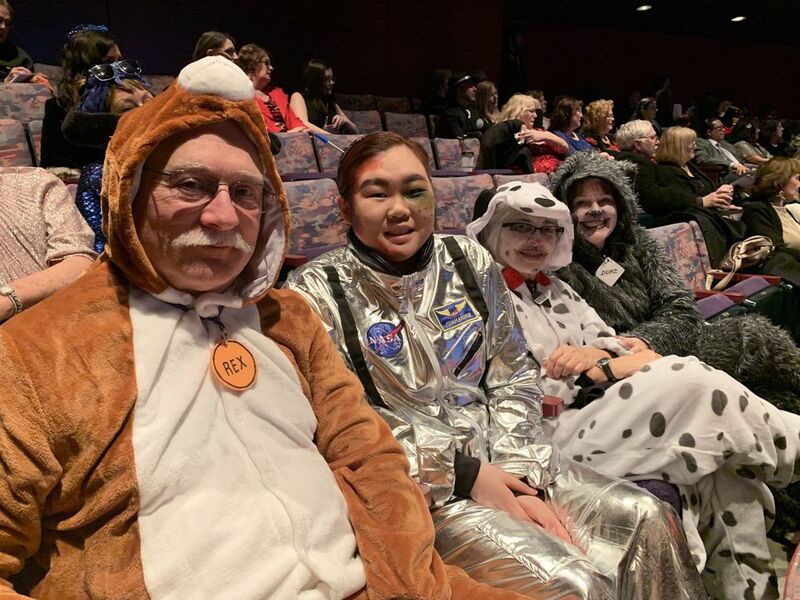 There was a red carpet, “paparazzi” – student volunteers from local high schools – a photo booth with fun props, and many party-goers who showed up in whimsical outfits: Gowns with white gloves, 18th-century fashion and costumes from some Oscar-nominated movies. 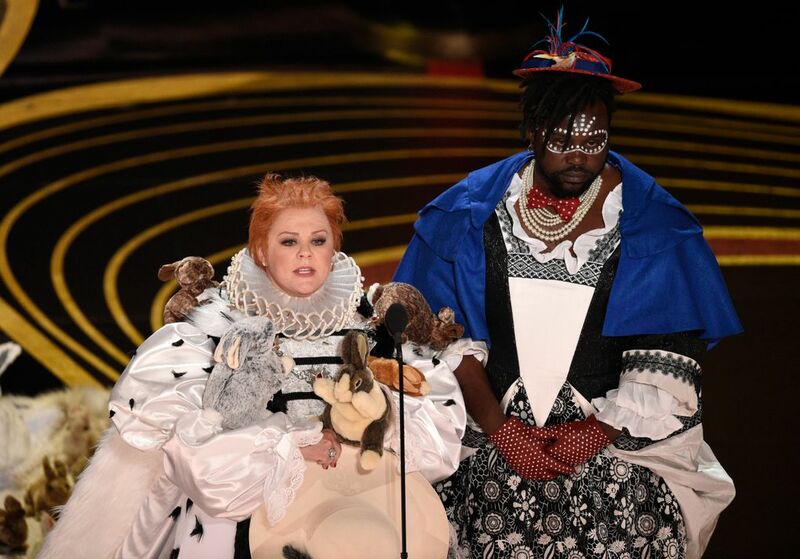 Best Oscar Presenter: Melissa McCarthy and Brian Tyree Henry had the audience, and myself, laughing as they dressed up as characters from “The Favourite.” Stuffed animals and all. Biggest snub: The emcees proclaimed that “Won’t You Be My Neighbor” was snubbed for Best Documentary, and several members of the crowd agreed. Best performance by a snack: Vanilla cupcake with light pink frosting and edible pearls from Hello Cupcake in Tacoma. This cupcake was perfectly sweet. 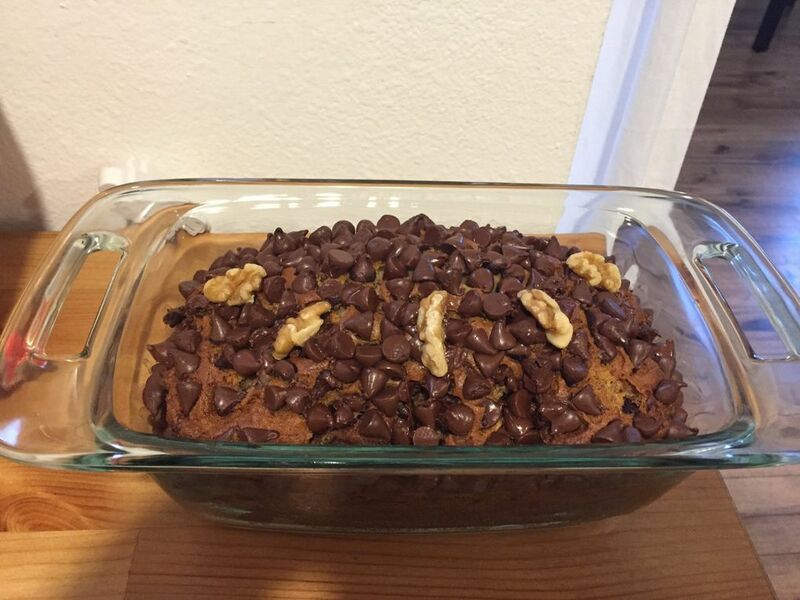 The frosting was fluffy and the pearls added a delicate crunch. 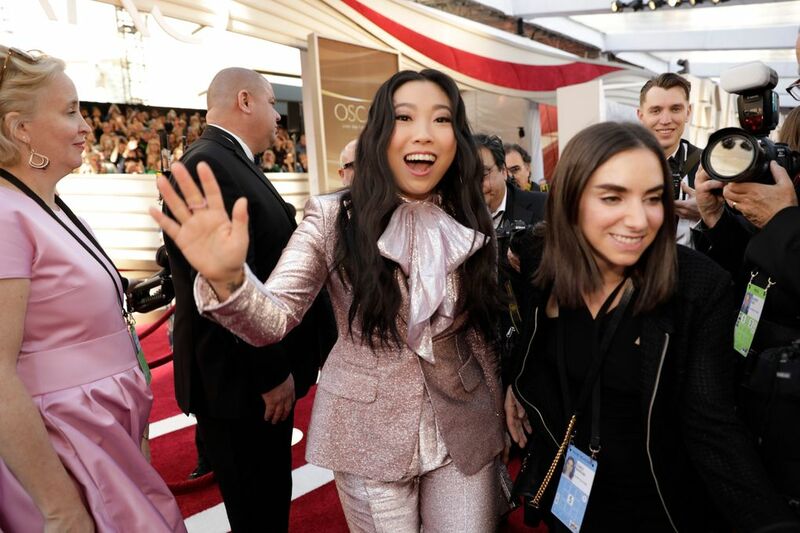 Best power suit: I love a good power suit, and while quite a few ladies rocked them, Awkwafina wore my favorite. A sparkly number with a big ruffle in the front designed by DSquared made for a head turning look. Best quote of the night: “Khaleesi has nothing on (Ruth Bader Ginsburg). Justice Ginsburg, if you’d ever like to borrow the dragons, ring me.” — Emilia Clarke. So unassuming is the location of the Cloud Room – a hosting bar/co-working space – that some people had trouble finding this Oscars party. The subdued vibe didn’t end there. A crowd of about 40 milled about the dimly lit minimalist space, all egg-shaped chairs, fluffy rugs, shelved records and elegant plants. It was no raucous dress-up occasion, but a pleasantly laid-back affair — almost as cozy as watching at home, but with better roughage and slicker design. And the delighted reaction to “Free Solo’s” win for Best Documentary was a mini-explosion — nobody claps for a climbing documentary like a room full of people in Seattle. Best Oscar Presenter: John Mulaney and Awkwafina. I look forward to the inevitable buddy comedy Netflix deal with eager anticipation. Most cringeworthy win: Look, I love Lady Gaga, but using your Oscars speech to talk about how hard you’ve worked — in a field of candidates where that was likely true of everyone, including your co-writers? It’s a weird pivot. Still, she totally deserved to win. I saw that eye contact during her performance with Bradley Cooper. Moment that made these three hours worth it: Seeing Olivia Colman take home the trophy for Best Actress and make a characteristically fumbling, charming, very British acceptance speech. Any of the nominees could’ve won, but Colman is the one I wanted to win. I love seeing actresses who are consistently good in everything win in a category that often prizes younger, less accomplished nominees. Biggest snub: Pre-show snubs that still stung during the ceremony were the fact that Ethan Hawke was left out of the Best Actor category (“First Reformed” is arguably his best work, and most of his work is among the best) and that no women were nominated for Best Director (despite a talented pool of available candidates). No snubs were particularly surprising (I knew “Green Book” was going to win), but it would’ve been nice to have seen some more love for “The Favourite,” a perfect poison ring of a movie that’s much funnier than I’d been led to believe it would be. Best performance by a snack: Popcorn in punch bowls with real red-and-white striped popcorn bags was a clever (and tasty) move. Best costume design: From Mahershala Ali’s 70s teardrops to Laura Dern’s teleprompter readers to best costume design winner Ruth E. Carter’s coordination of ball gown and chunky frames, it was a good night for glasses. Best surprise guest: A brown-and-white dog nosed through the Cloud Room early in the evening. It was adorable and I did not find out its name. I had the same roommate throughout college, and we bonded over our love for awards-show season. It became a tradition for us to pick apart the Oscars red carpet looks preshow, and memes and mishaps post-show. Our sophomore year, we crammed seven people into our tiny dorm room to watch the Oscars, only to later be scolded by our residential adviser for making too much noise when we all screamed after Leonardo DiCaprio won his first award. This year, my old roommate wasn’t able to make it, but I hosted an Oscars party at my apartment anyway. 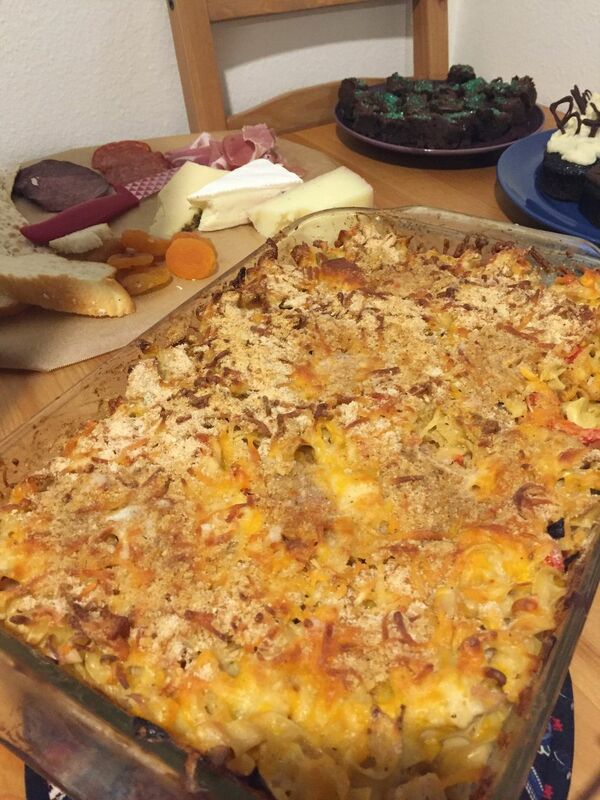 A snack was required for entry, but other than that, it was an informal evening of us yelling at the TV and each other as we watched some of our favorites win and others get snubbed. Best Oscar Presenter: Awkwafina and John Mulaney are the millennial comedian duo we all deserve. 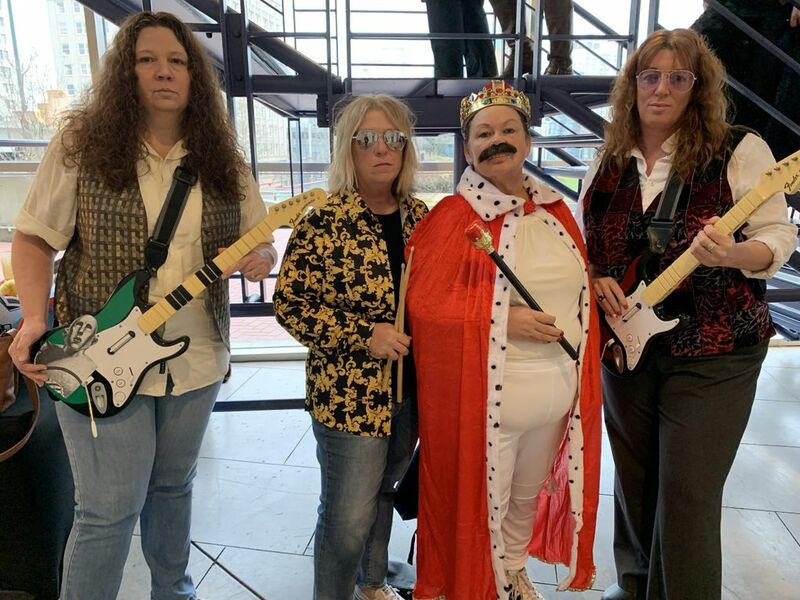 Their general awe toward the glitz and glamour of the night and their weird styles of humor made for a memorable presentation of some smaller categories. Biggest snub: This one is dedicated to all of the award winners who had their speeches cut off too early. This is one of the biggest nights of their lives, so to get quickly played off with daunting orchestral music for the sake of time seems rude. Any time more than two people went up to accept an award, our whole party would yell at the TV, hoping that they’d talk quickly and give everyone a chance to speak. Best costume design: Is it cheating if I give the award to myself? 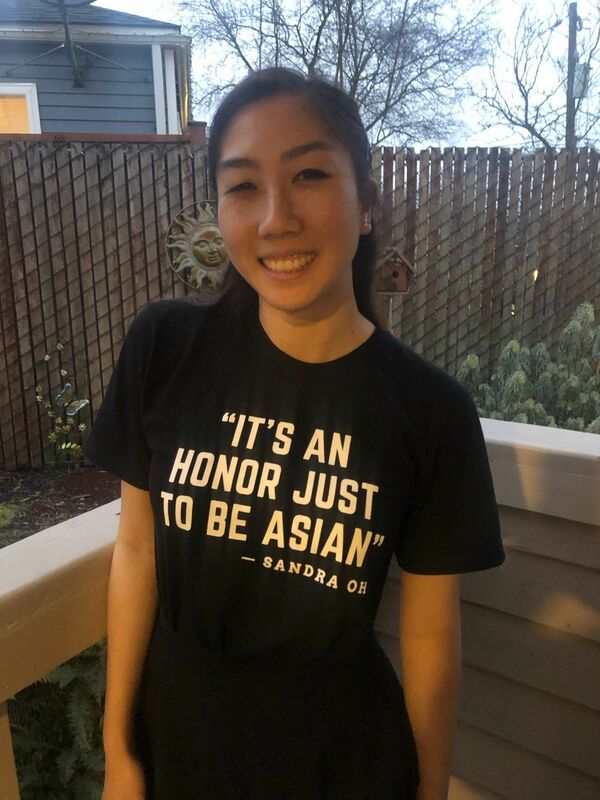 At last year’s Emmys, actress Sandra Oh half-jokingly/half-seriously said, “It’s an honor just to be Asian,” as a nod to the lack of Asian representation in Hollywood. I impulsively ordered this shirt after watching Oh co-host the Golden Globes. We still have a long way to go, but with “Crazy Rich Asians,” “Minding the Gap,” “To All the Boys I’ve Loved Before,” “Searching” and many other movies from last year, it was heartening to see Asian representation elevated in Hollywood. Most beautiful presenters: Our eyes were truly graced by back-to-back presenting duos Tessa Thompson and Michael B. Jordan, and Constance Wu and Chadwick Boseman. Among our group of friends there were several gasps at how beautiful they all were. Best party speech: At the suggestion of (Seattle Times movie critic) Moira Macdonald, our party played a game that ended up being quite fun. At the beginning of the show, everyone was assigned a Best Picture nominee. When Best Picture was announced, whoever had the winning movie got to give a thank you speech. We were all shocked when “Green Book” won, but my friend Riley was happy to give a thank you speech, particularly thanking his mom, and me for hosting the party. 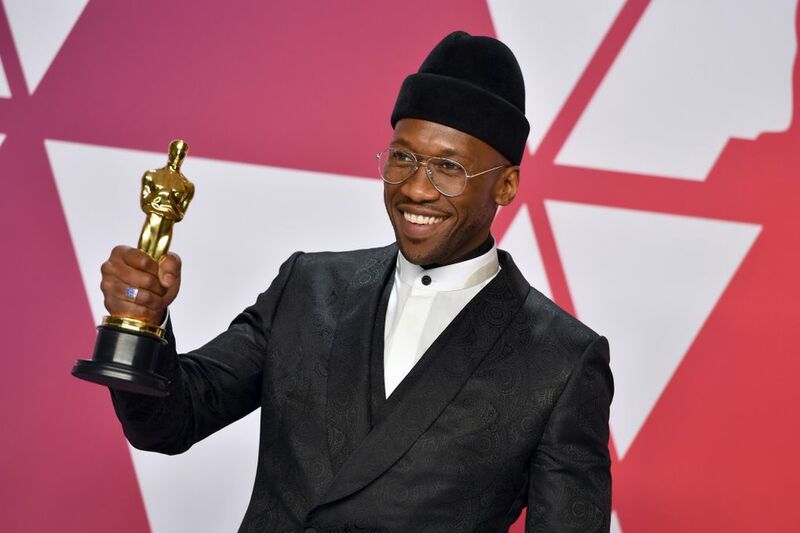 Correction:Three white writers accepted the Best Original Screenplay award for “Green Book.” An earlier version of this story incorrectly identified how they were associated with the film.